The Strain: Mister Quinlan–Vampire Hunter #1 Review – AiPT! There is no bond stronger than that of mother and child. Those who try to destroy that bond will most certainly pay dearly. Now imagine your mother is a demonic vampire who has lost all sense of humanity, sleeps in the dirt and drains blood from humans with a fanged, tongue-like appendage. You know she is going to put up one hell of a fight! Such was the beginning of Mister Quinlan, the fiercely accurate vampire hunter’s origin story. I have read The Strain trilogy and watched the television series so I am going to do my best not to post any spoilers for you newcomers. We open in early Rome–really early, 40 AD. Thrax, also known to us as the Master, is the trusted advisor to Caligula, one of the most insanely twisted emperors to rule Rome (it makes you wonder who influenced the other more). The Master has a, well let’s just call it a run in with Quinlan’s mother which augments his DNA. Fast forward and Mr. Quinlan vows to destroy his maker. What better way to train for the destruction of your maker than the gladiatorial ring? The flashback style of narration was a bit choppy at times; single words listed in succession. This surprised me because at over 2,000 years old I would suspect that Mr. Quinlan was quite eloquent. Perhaps the writer, David Lapham, was trying to evoke a poetic style but it came across as clipped and that pulled me out of the story a bit. One of the coolest parts of this flashback is that Quinlan is able to recount his tale back to before his birth. No need for Ancestry.com when you have vampire bloodletting, memory sharing. The black, white and red artwork is incredibly striking. I wish there were more of that style. The birth scene of Quinlan’s mother in the cave is particularly stunning. You can feel her pain and weariness. One of my favorite panels is the close up of Quinlan’s baby face. 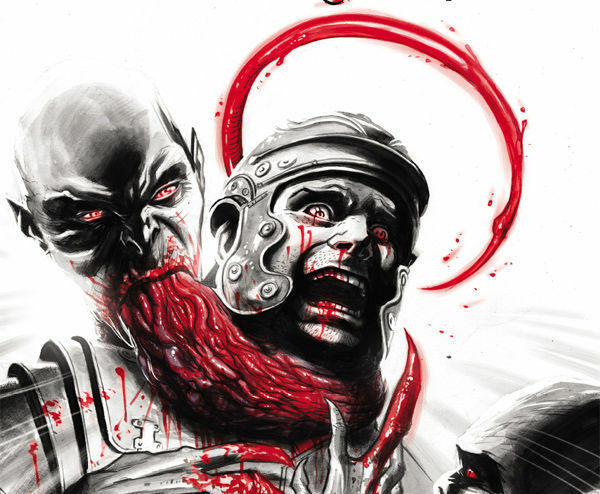 A cherubic face with blood colored eyes and plasma stained mouth that screams ‘vampire baby food ad.’ When we delve into the gladiator trenches the artwork becomes even more detailed, capturing every ghastly figure. Did I like It? Yes. Fans of The Strain books and television series will enjoy delving into this popular character’s back story, while newcomers will be able to pick up this book without feeling lost. The Strain Mr. Quinlan–Vampire Hunter is a classic tale of destroying your maker with a gruesome cast. My Fears? This will be a revisit of the books. I hope this story delves deeper and shows us a new side of Mr. Quinlan.